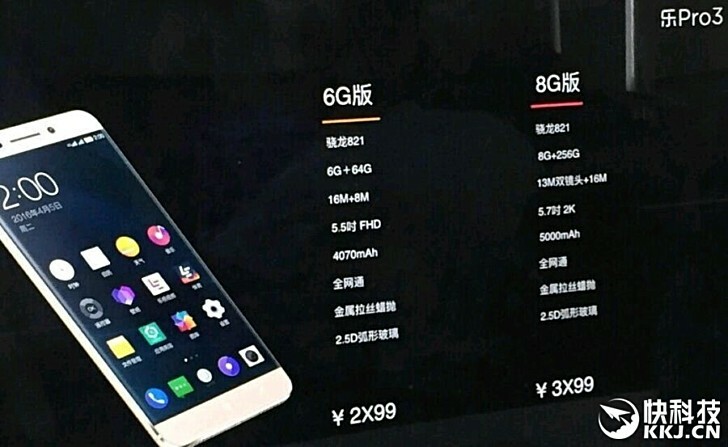 Rumors regarding LeEco’s upcoming supercharged smartphone, the Pro 3 flagship, have been stirring, and it purportedly comes with a Qualcomm Snapdragon 821 chipset that’s paired with 6GB of RAM. While that alone would probably raise a couple of eyebrows, you would be surprised with the latest leak. It looks like the company’s upcoming handset is rumored to have a variant that sports 8GB of RAM as well as a whopping 256GB of internal storage. According to the latest leak, the new variant of the handset will come with a bigger display of 5.7 inches. On the other hand, the 6GB variant that has leaked a while back will arrive with a 5.5-inch display with Full HD resolution. As far as photography is concerned, it’s rumored to have a 13MP dual primary camera set up to battle the likes of other flagships that have jumped into the trend. Furthermore, it will also come equipped with a 16MP front-facing shooter to please those who frequently take selfies. A 5,000mAh battery will power it up, too. In terms of release date, the LeEco Pro 3 is expected to be unveiled during an event this coming September 21st, which is only a couple of days from now, so it won’t be long until we finally verify if the leak holds true.